Tell me, please more about your family and childhood and education background? I was born in Shayar county in East Turkistan. The region was occupied by the Chinese Communist Party in 1949 and re-named in 1955 as Xinjiang Uyghur Autonomous Region. Shayar is located close to the Tarim River on the northern edge of the world’s second largest desert, the Taklamakan. I lived in our village Yengi Chimen until I finished my primary school. My early memories of my family are of my mum carrying me to school on her back, and coming home and finding there was no food to eat. That was the last years of the China Great “Cultural Revolution” and I always felt hungry. After finishing Primary School I went to boarding school in our local town Toy Boldi. I didn’t know at that time that was I was saying goodbye to the village and would never live there again. In 1985 I went to No. 1 High School in Shayar Town. I passed the University exam and in 1988 I was accepted to study Russian and Chinese languages at Xinjiang University. How did you go to London and what are you doing now? I came to London by lorry from Calais, France in August 2001. After I arrived in London, I was kept in a refugee “reception centre” near Cambridge for 15 days because I had illegally entered the United Kingdom. I was granted political refugee status after five months. At that time I gave an interview to the BBC titled ‘How I got to UK illegally’ on Thursday, 14 March, 2002. The story is still on their website: http://news.bbc.co.uk/1/hi/uk/1869263.stm. What is happening to the Uighur now? Historically? Plight of the Uighur now ? China has locked up over a million Uyghurs in extra-judicial internment camps. Its treatment of the Uyghurs is inhumane. Can you imagine your parents, brothers and sisters don’t dare to answer your phone call because they will be arrested and locked up in a detention facility if they do? That is exactly what’s happening to Uyghurs living outside China’s borders. We can’t get visas to visit our families even if our parents are on their death beds and want to see us one last time. This is not because we or our parents did something to deserve this treatment, but simply because we happen to be Uyghurs. Situation now similar to the Cultural Revolution 1960’s? I think that it is worse than China’s Cultural Revolution in the 1960’s. What has been done and at what level? -UN -ICJ -OIC? China is committing crimes against humanity in East Turkistan but sadly, world governments are still doing too little about these crimes. There have been worldwide protests against the Chinese Government’s treatment of the Uyghurs, and the UN and the European Parliament, UK Parliament and the US Congress have raised the issue with China, but China has simply denied the charges against it. What is the best solution to the problem? Autonomous? Separation? The Uyghurs only wanted to live in peace and be granted their rights to cultural and religious freedom but now it’s clear that this cannot be expected from China. Only Uyghur Independence will solve this crisis. China charges Uighur as terrorist and extremist. Is that true? This is a fake mask made in China for Uyghurs. Uyghur have never given up their desire to live as an independent people and independent country, and before 2001, China’s campaigns against the Uyghurs mainly took the form of campaigns against separatism. Since the “War on Terror” started in 2001, China hijacked the idea of “Islamic extremism” and used the fact that Uyghurs are Muslims to legitimate their repression of the Uyghur. Uyghurs and Tibetans had distinct homelands, identities, history and cultures and lived as equals to their larger neighbour China for much of the last 2500 years. There were times they were politically and militarily stronger than China and provided help when asked. This history is all well-documented, but today China treats us as backward, primitive and in need of civilising. What are your hopes and next plans? We are in this place today because so many governments are now too indebted to China or too keen to make trade deals with China to care about its human rights abuses. If international governments were more principled and were willing to highlight China’s unacceptable behaviours, we would be in a much better place. The world needs to take responsibility for the deteriorating situation before it is too late for the Uyghurs. Many thanks to AZIZ ISA ELKUN. He was born in East Turkistan (Uyghur Autonomous Region, China). He spent his childhood in Shahyar county which is located close to the Tarim River on the northern edge of the world’s second largest desert, the Taklamakan Desert.He graduated from Xinjiang University majoring in Chinese and Russian and languages. He has been living in London since 2001. He studied at Birkbeck University in London. 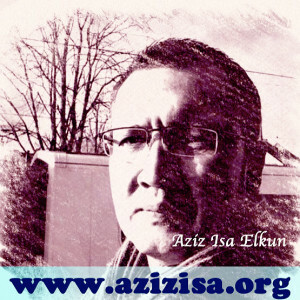 He has published many poems, stories, and research articles in both Uyghur language (www.azizisa.org) and English (www.azizisa.org/en). He has co-authored English language articles in Inner Asia and Central Asian Survey (‘Invitation to a Mourning Ceremony’: Perspectives on the Uyghur Internet and ‘Islam by Smartphone: the changing sounds of Uyghur religiosity’). He worked as Research Assistant on the “Sounding Islam China” project based in SOAS, University of London, and conducted collaborative fieldwork in Central Asia for the project.In 2017, he published a Uyghur language research article arising from this fieldwork, titled “The Uyghurs are known in Central Asia for their laghmen”.He is an active member of the exile Uyghur Community and founder of a Uyghur music group – the London Uyghur Ensemble (www.uyghurensemble.co.uk). Since September 2017, he has served as Secretary of the International PEN Uyghur Centre (www.uyghurpen.org). 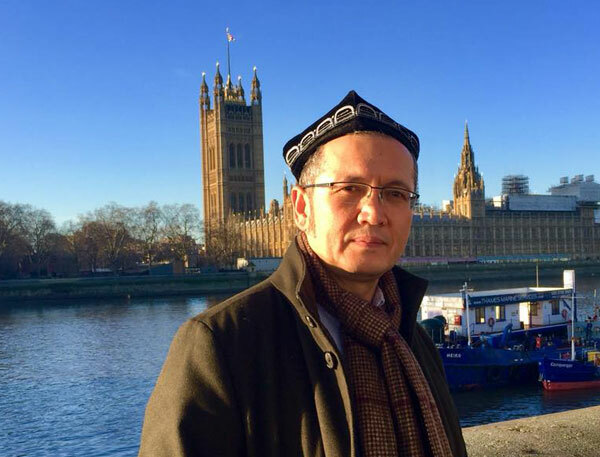 From September 2018, he is working as a researcher on a British Academy Sustainable Development project “Uyghur Meshrep in Kazakhstan” based at SOAS, University of London.